A possible alternative to basic principle 12 for making masonry structures substantially more suitable for seismic actions is to reinforce some long masonry walls and thus stiffen them in the longitudinal direction. In this case, for example, vertical and horizontal minimum reinforcement and stronger vertical reinforcement in the boundary zones must be detailed . Thus sliding in the horizontal layer joints can be prevented and a global ductility of up to µ∆~=2 can be achieved. The reinforced walls can therefore be considered as «structural masonry walls for horizontal actions. 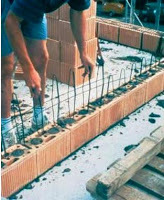 The horizontal displacement of the reinforced masonry walls for the design earthquake must not exceed the ultimate displacement capacity of the stiffest i.e. longest, unreinforced masonry wall. This is necessary to ensure that the vertical loadbearing capacity of the unreinforced masonry walls is preserved.